Jurassic Park: The Game is an adventure game created by Telltale Games, considered by many to be the last bastion of the point-and-click adventure. 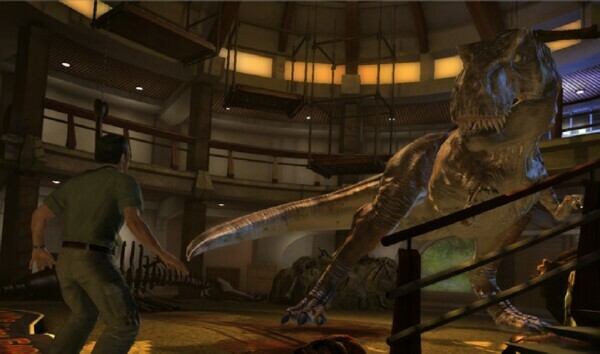 At times, Jurassic Park: The Game wears it’s namesake with honor, successfully capturing the taut suspense of a dinosaur chase, as well as the the grandeur of nature in several well directed scenes. But the momentum soon begins to faulter, then stumble and eventually just seems compliant to lie in the mud. JP:TG begins just before the events of the original Jurassic Park movie ended, when the dinosaurs are running rampart across Isla Nublar and the last people on the island are scrambling to get off. 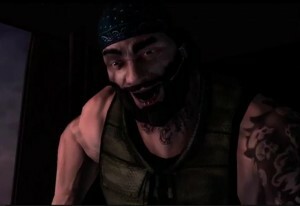 In early portions of the game, they use this particular time frame to great effect, the writers clearly taking pride in creating allusions to famous scenes in the movie. You revisit some recognizable set pieces, hear new characters quoting familiar lines from the film, find yourself in scenarios reminiscent of those faced by the characters in the movie (like daring to touch a potentially electrified fence) and are even subtly shown the helicopter carrying the movie characters away to safety without explanation or needless exposition. One of the very first locations you visit is the spot where Nedry, the dino-embryo stealing computer programmer portrayed by Wayne Knight, was killed by the acid-spitting Dilophosaur in the film. After doing the modern day equivalent of a pixel-hunt, where you scroll the camera’s field of vision from a fixed angle across the scene attempting to identify points of interest, you actually manage to recover the Barbasol can containing the dinosaur embryos. JP:TG features a few interesting characters as well as one really annoying class-clown that the audience (notice I didn’t say player) is apparently supposed to find humorous and charming, I wasn’t convinced. The ‘leading man’ Dr. Gerry Harding, who is only featured briefly digging through dinosaur feces in the original movie, is little more than a hook to hang the story from. As the game progresses the automatic goodwill voluntarily granted by Jurrassic Park fans will begin to wain as ever increasing sections of the game entail ridiculous dialog trees and illogical actions performed by the cast of characters. JP:TG follows a simple formula unwaveringly: Cutscene, Puzzle, Quick Time Event (QTE), repeat. The majority of the game is spent with your controller held limply in your hands as characters discuss their dilemma and feelings for several minutes at a time before the inevitable puzzle solving which will doubtlessly lead them into danger. At one point, early in the second episode (of four), three of the protagonists stumble across an unfinished roller coaster which has been constructed, for some reason, off the side of a cliff. They need a way to descend the cliff so naturally repairing the disused amusement park ride is their chosen course of action. Once you manage to turn the power back on, remove fallen scaffolding from the tracks and rearrange the carts in a puzzle reminiscent of the mini-game staple, Tower of Hanoi , the characters strap themselves in only to be immediety assaulted by a pair of theropods on their way down the track, after completing yet another QTE to survive the encounter, the characters find themselves back at the top of the roller coaster where they then abandon the idea of riding it down the cliff. All the effort put forth in solving this tedious puzzle is revealed to be utterly in vain. This lengthy set piece adds nothing to either character progression or simple amusement. It’s one of several areas of the game that show a distinct lack of creativity on the part of the designers, which becomes increasingly frustrating as you play, because the artists and sound engineers did some solid, if flawed (see below) work in doing the island’s flora & fauna and terrifing-yet-beautiful ambiance justice. The 3D engine powering the game just doesn’t seem quite up to the task. At the highest graphical setting the game pauses jarringly between pretty much every camera transition, having just played RAGE, Assassin’s Creed Revelations and Skyrim at full settings it’s clear that the architecture just isn’t as optimized as the triple-A titles. This technical issue could be more easily overlooked if the game was just better than it is, unfortunately this is just another demerit the game earned as I struggled to segregate the positive elements from the detracting ones. There are also some minor audio issues. At certain points the music, sound effects and voice acting all culminate into a cacophony of noise, sometimes with humorous results. Jurassic Park: The Game does a few things right, but gets more of them wrong. At the very least, the game does try to stay true to the original movie’s tone sacrificing gameplay for a more cinematic approach. Fans of the Jurassic Park films and/or novels are sure to get at least a few hours of enjoyment out of the game, but once the initial wave of nostalgia wears off you are left with what basically amounts to a series of unskippable cutscenes punctuated by a variation of “Simon Says” where the only way to progress in the storyline is to hit a sequence of buttons at timed intervals. Why so high? For all it’s short comings, it can be an enjoyable experience in short stints and it’s attention to detail is easy to appreciate. Why so low? Every respectful nod to the movie is tarnished by cringe-worthy dialog and ill-conceived puzzles, many of which can only be solved through monotonous trial-and-error.